Yesterday I announced we'll be going to the Geronimo Festival, and today I am happy to say that so will one of you, as I have a Family Ticket to give away to one of my readers! Geronimo is back! And this year it’s going to be bigger and better. Seeing a return to Tatton Park in 2016 from May 29th – 30th and a new venue at Harewood House from May 1st – 2nd, expect a line-up jam packed with some of the biggest names in children’s entertainment, including TV favourites Justin Fletcher*, Mr Bloom, Andy Day, Alex Winters and Cook & Line from Swashbuckle. Geronomites will also be able to enjoy a brand new theatre and literary zone with award winning productions and a second stage featuring live music. The craft marquee is bound to inspire and don't forget the full Geronimo circus and 100 other crazy and unusual activities like giant Tortoise encounters, stone carving and a crime scene for kids to solve. Geronimo will also bring the beautiful woodlands to life with den building, high rope courses and a chance to tick off some of your "50 things to do before you’re 11 3/4". The whole programme is for the under 12s and tickets are on sale now priced £25. Children under the age of two go free. Find out more and buy tickets on the Geronimo Festival Website. We've got one family pass (up to four people - under 2's are free) to give away to one lucky family. Each pass admits 4 people, one person in the group must be aged over 18 (children under the age of 2 years do not require a ticket). The winning family can attend either on May 2nd (Harewood House) or May 30th (Tatton Park). The date must be specified at time of confirming the prize. Travel and accommodation are not included. The prize is non-refundable and no cash alternative will be offered. The prize is non transferable and ID will be required at time of collecting the ticket wristband upon arrival. The prize includes all events and activities at Geronimo but not food and drink from any stalls or bar. Winner chosen at random. *Please note, Justin Fletcher will be performing on Sunday 1st May at Harewood House and Sunday 29th May at Tatton Park only. To enter, please use the Gleam form below. The giveaway will end at midnight Sunday 3rd April and is open to UK entrants only. Please read the terms and conditions above, and at the bottom of the Gleam form, and only enter if you can attend either on May 2nd (Harewood House) or May 30th (Tatton Park). 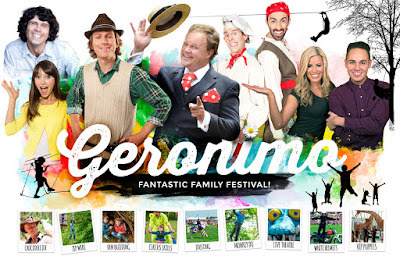 We will have free family entry to Geronimo as part of our role as ambassadors. I think my son would like to see Mr Bloom however I have a soft spot for Cook and Line!!! Andy Day- I need to tell him he pronounces Diplodocus wrong! Cook and Line, we love them! a chance to tick off some of your "50 things to do before you’re 11 3/4". Andy and his dinosaurs - my sons love him! I'm most looking forward to seeing Andy and Mr Bloom. We're most looking forward to seeing Mr Bloom - my son loves him. Andy from Andy's dinosaur adventures! I would like to see Mr Bloom.